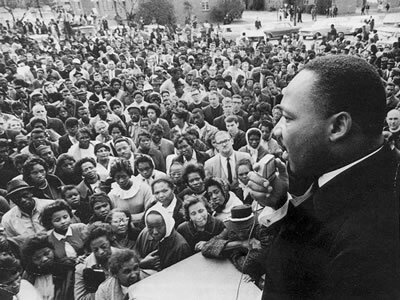 The audience in Mason Temple was justifiably enraptured as Martin Luther King, Jr., preached yet another gripping and inspiring sermon. As he moved to conclude the sermon his mind--and the minds of the audience--were drawn once again to the weapons and bombs that were threatened and used against them.Martin's flight to Memphis for this cause had been delayed by yet another bomb threat.He concluded the sermon, "We've got some difficult days ahead. But it doesn't matter with me now. Because I've been to the mountaintop. And I don't mind." As the imagery settled, he continued: "Like anybody, I would like to live a long life. Longevity has its place. But I'm not concerned about that now. I just want to do God's will." This would prove to be a dark foreshadowing of the limited time left on earth for Martin. He finished"And He's allowed me to go up to the mountain. And I've looked over. And I've seen the promised land. I may not get there with you. But I want you to know tonight, that we, as a people, will get to the promised land. So I'm happy, tonight. I'm not worried about anything. I'm not fearing any man. Mine eyes have seen the glory of the coming of the Lord. "With these words, Martin ended his sermon and went back to room 306--a room he had stayed in often--at the Lorraine Motel in Memphis.